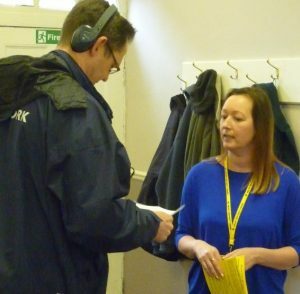 On Saturday, 25th Feb 2017, the monthly SDV coffee morning at the Kings Church Hall in Selby was interrupted by Jeremy Buxton in the course of the Finders Keepers radio programme. 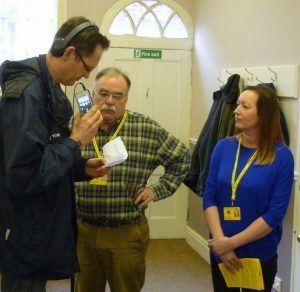 This very popular broadcast is hosted by the lovely Clare Frisby (in the studio) whilst Jeremy and his sidekick/driver rush around North Yorkshire solving 6 clues with the aid of the listeners to ultimately find the treasure. Where Anneka Rice had a helicopter, Jeremy has a van! 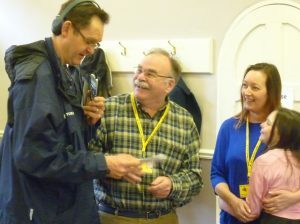 Jeremy was able to talk to SDV Chairman John Cattanach and Joanne Reader from whom he received the next clue. 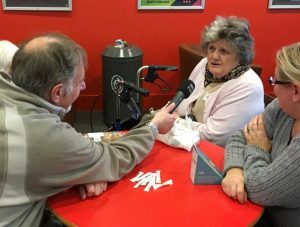 Finders Keepers is broadcast every Saturday between 9 am and noon (Visit BBC Radio York site here) and can become addictive. You have been warned. 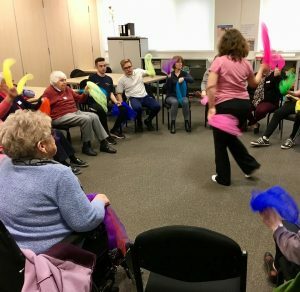 At the end of November, Jonathan Cowap of Radio York attended one of the monthly sessions of Vision Fit, a special exercise session organised by Selby District Vision for the visually impaired and held at Selby College. On Thursday, 30th November he made his visit a major feature in his morning show and the 4 sections of his broadcast can be heard here in our audio playlist below (click on the triangle icon or track to play). 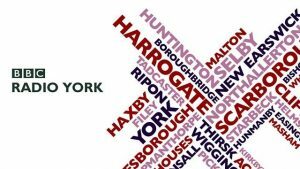 We have to thank him and BBC Radio York for this and acknowledge their ownership of all broadcasting rights.